I wrote an essay for an anthology by poets on poetry a couple of years ago about owning one’s subject matter, taking responsibility for the themes that continually crop up, and stewarding and loving them, no matter that they might be “too poetic” or “too weird” or too anything… and my subject was (is. IS.) death. A dear friend of mine, also a poet, recently lost his brother, and I realized I kept having the urge to reach out to him through our shared creative endeavor. I wanted to use poetry as an emollient or girder, not necessarily for sentiment but for the joy of language, the little lift you feel when you read a poem that really nails it with an image or string of sounds you’ve never experienced before. This is what poetry does, offers us tiny, unique moments that are entirely new yet entirely familiar. And really good poems offer these tiny joys, even if we’ve read them many times. The Frost Place, “a nonprofit educational center for poetry and the arts based at Robert Frost’s old homestead,” in Franconia, New Hampshire, recently asked its Facebook followers to post lines of poems that had wounded them. I wriggled with happiness at being asked such a thing, to recall the pain of a poem, because that wound came with a simultaneous smash of pleasure at reading something that could move me. I quoted the last two lines of Traveling through the Dark by William Stafford. This poem is well-known and well-loved among poets, I believe, so the wound is likely not mine alone. And surely, I’ve read many (many, many) other poems that have had this effect, but the Stafford came instantly to mind, so I figured I should honor it and share. I remember the first time I read the poem, how I froze in fear and surprise as I watched the deer disappear over the ridge. This must be, on some level, what my friend is feeling as he suffers this first phase of grief and loss. All the poems in the world could not remedy this, but maybe they can meet him where he is, making their small, distinct clangs of joy. I’d love to hear which lines of poems have done this for you – quote or link to them in the comments. And if you need a venue to hear such work, come to the Library’s Monday Poets Reading Series – held the first Monday of each month – for free! 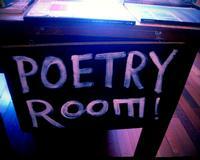 A blog series about all things poetry. The small pang of grief your refer to is like the little sting that comes with a sip of fine whiskey?